Home » Writing • Writing Advice » Nine Things Writers Can Learn from (ahem) Science. The Atlantic called Edge.org “an epicenter of bleeding-edge insight across science, technology and beyond.” So when the website came out with a new book—This Will Make You Smarter: New Scientific Concepts to Improve Your Thinking—I went for it. Yes indeed, I read it cover to cover, sacrificing myself to the greater Writing Good. 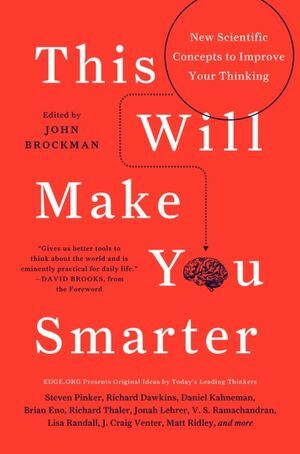 Here’s the deal: 150 of the world’s most influential thinkers were asked the same question: what scientific concept would improve everybody’s cognitive toolkit? The book collects their answers, and I’ve mined 9 ideas writers can use today, no science jargon necessary. You’re welcome. 1. YOU Make the Meaning. Carroll explains that, in a sense, the universe is pointless. There are no “reasons why” things happen—other than that they are the product of the universe behaving according to its laws. 1. Am I waiting for someone or something else to give meaning to my work? How can I take the reins? And 2: Am I making excuses for myself, my craft, or my content, based on a sense of fate? If you’ve sealed off certain possibilities because you think the outcome’s predetermined, rethink your limitations. 2. Experiences Are Also Experiments. When we see our experiences as experiments, we’ll recognize their outcomes as data to be analyzed. We can then learn about our habits, our practices, our own causes and effects. What might your experiences experiments—whether as a writer, teacher, presenter, or performer—objectively tell you? What can you add, eliminate, or transform in order to get different—and better—results? 3. But Beware: Experience Can Also = Bias. If we learn from experience (as in #2), great! But if it keeps us from exploring because we think we already know (or don’t need to know) the outcome, experience will derail creativity. How have your experiences formed unconscious expectations, limitations, and/or predictions when it comes to your craft or content? Where can you attempt new causes, and/or expect different effects? 4. Throw Out Your Outdated Sh*t.
But your old ways, with their eclipsed justifications, may yet be changeable! So: what are you doing as a writer that has no present justification/reason? (Think of your routines, “rules,” etc.) Maybe these made sense at one time, but do they still? Are you sure? In short: what’s no longer relevant? 5. Love You Some Failure. Write. Push yourself. Push your content. Give the finger to your (and others’) boundaries and expectations. Commit your “writing sins.” Fail. Embrace the failure. Repeat. Okay, Zweig Writing Insight A: when you’re doing prolonged, focused writing—and particularly if you’re “stuck”—take a break. There’s a reason aha! moments often happen in the shower: it’s great for brain shift. So commit to a different focused task for a specified amount of time: wash the dishes, call a friend, go for a walk, or um—take a shower. Give your brain a chance to reach a Eureka. And Zweig Insight B: read trade publications about non-writing trades, and read lit genres you don’t write. Let your brain draw connections. Relax. The mental exploration will increase your creativity. 7. Log out. Shut off. Hooray. Um. That’s about it. You can only absorb and handle so much. It’s scientifically proven. Turn your devices/wi-fi off, and write. Where do you write? What do the objects around you do for your mind, energy, creativity? Are they helping, or getting in the way? Symbols will affect your work (one way or another! ), so get purposeful about your environment. Declutter. Put inspiring symbols or pictures nearby. Cart around a great photo or a worn book you love. Your environment WILL seep onto the page, so use it. Aguirre suggests we push at paradoxes: sharpening and examining them. Writers have long exposed cultural and political paradoxes, revealing foundational disagreements between a society’s equally-valued beliefs. Such investigation may generate compelling content for you, too. But loving us some paradox is also great for creative practice. Consider the Prime Writer’s Paradox: We want to write. Also, we keep not writing. We’ve all wondered, How do I find the discipline to write consistently, to get my work done? I want to write; I don’t want to fail. I want to write; I don’t have anything to say. I want to write; I’ll be rejected. I want to write; I want to be comfortable. By confronting our own paradoxes, we can banish subconscious assumptions—and productively alter the way we think about our work. Tell us what you’ve learned from your writing experiences experiments! How do you prevent information overload? What do you do for productive breaks when you’re writing? How are you addressing paradoxes (yours or others’)? Lend your Comment Love below!